Happy Wednesday - official hump day! So excited to keep showing peeks from the March release from Taylored Expressions!! WOOHOO!!! Today I am peeking the newest Moka on the blog: Moka Meredith! She is so cute isn't she with her sunglasses and her camera across her neck!! That's my kind of girl - I always have my camera - and now my kids do one of two things when I try to take pictures of them - 90% of the time they either run away as soon as the camera comes out or they groan loudly, do a couple of eye rolls and grudgingly pose for the camera (and quickly give me a smile - you have to snap it quickly because that smile comes and goes quick!!!). 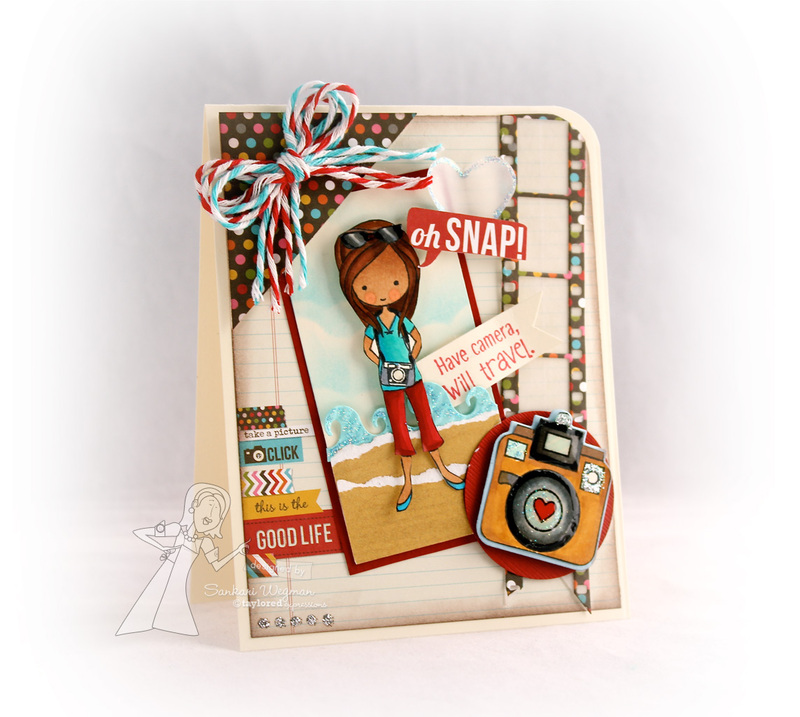 Accessories: Wave Border die, Film Strip border die and Oh Snap Camera dies from Taylored Expressions, dimensionals, circle punches, vellum, glaze, red and blue twine, heart punch, stickels and corner chomper. Please hop over tomorrow for some release day fun!! Your beach scene is so fun! Love the colors and the banners on the edge are adorable! Oh boy, I just love your fun card!! Such a lot of detail; really cute!! TFS. Wonderful, Sankari! Love the papers you paired her with and the sweet beach scene you created! This is just darling! I LOVE that you put her right on the beach!!! What a darling card! I just love how crisp it is. . .the colors and coloring are perfect!